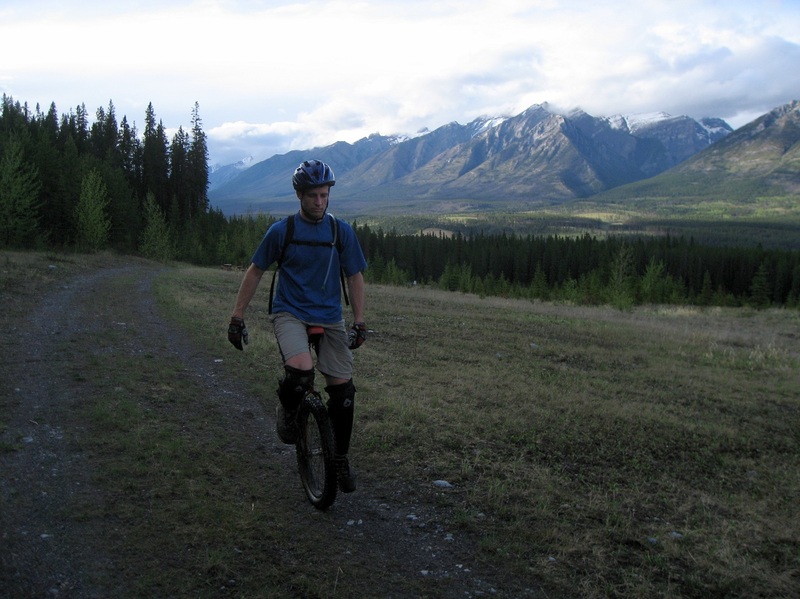 Mountain unicycling is a regular past time for me, which I’m sure you have read about before if you are a regular reader. Its a sport not many venture into as it has a steep learning curve and there are simply not that many people who do it to be encouraged by or to learn with. I have to seek people out who have the same interest, as I am not very likely to just come across other unicyclists. Surprisingly, once I do get out and go riding, I run into a lot more people who are able to ride and will tell or show me when I encounter them. I’d never know though without being out on the unicycle in the first place. For the most part, I definitely enjoy to ride with other people, but with my level of experience in the sport and endurance, I do not have other riders who get out on one wheel with me in the mountains. So, because of that, I often ride with mountain bikers who will easily give me a run for my money with all of their mechanical advantages. Other times, I simply ride on my own, off in solitude, just me, my muni and the mountain. That is what I truly love about the sport. Getting away from the city, the traffic, the stench, the thick polluted air and of course gobs of people. In the mountains you can literally ride for hours and not see another soul. Its a place of peace, a place for thought and to be content. The trails I ride are certainly not easy, most are hiking trails, but rated as more difficult ones as I love to ride areas that are known as very technical. If you don’t know, that is when a trail has a lot of roots, rocks, boulders or obstacles to navigate and will typically be more windy with more ups and downs than other easy hiking trails. It’s in that kind of riding where I am challenged and can get into a state of flow and enjoy the ride the most. Flow is all about movement on the unicycle. 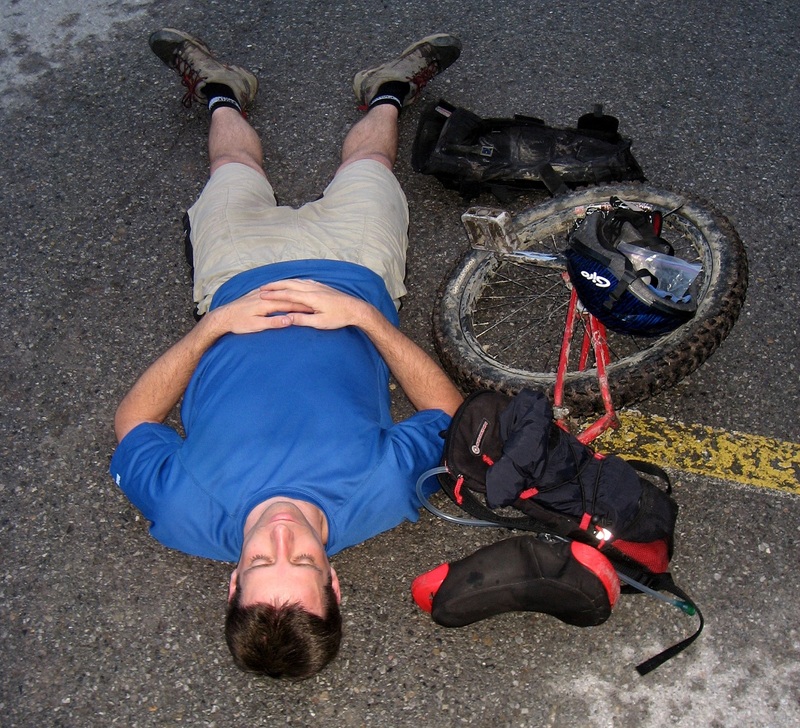 Its not easy to navigate rough terrain on one wheel and it requires years of practice. 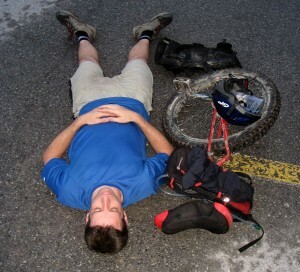 On a mountain unicycle, to ride advanced trails, one must learn to ride with their whole body for motion. I don’t simply peddle with me legs and steer with my arms. I have to put everything into the trail, my whole body, mind and motion in order to stay on top. I have to bend my body, thrust my upper torso up and over rocks, whip my shoulders and head around to steer the trail, and pull with all my strength up on the seat handle to lunge with the muni overtop of gaps or logs. It’s a great workout for the legs and core, but more than that, it forces me to focus and to free my mind of all the other daily activities, thoughts, problems and feelings and simply enjoy the ride, the workout and the environment where I am riding. It feels very free to have these times of solitude and solitude is something that really strengthens me. It always has and it’s always been my sports where I can enjoy this level of solitude and freedom. I have other sports that are the same, windsurfing and I am just getting into snow kiting as well. I’m sure that is what attracts me to these sports even if it has never been intentional. So my title may need some explanation. The fortress of solitude is a reference to Superman’s Ice fortress that he has to escape to, away from all people. He goes their to seek answers to his struggles with the world and he goes their for freedom and solitude. That is exactly what I feel like I have in my escapes to the mountains or on the water in incredible winds. My focus shifts at those times not just to the sport, but more to my fortress of solitude. It is a place to recharge my spirit and mind, to be free and to be content and enjoy life. So let me ask you, do you have a fortress of solitude that you rely on for a similar freedom? 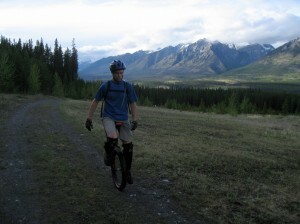 See some more of my unicycling pictures in my photography section of panoramas on this site. I have read about your unicycling on here before – I find it fascinating, have never heard of anyone doing this before, especailly in the mountains! I have to have my fortress of solitude – I hike. I find a huge area of countryside (I’m lucky the South of England has miles and miles of fields, woodlands, and no people!) and just walk and walk. I usually go ‘off road’ and often get lost but thats just part of the fun. After a good few hours my head is unbelievably clear, I feel great and am already planning my next adventure! Oh, I understand completely how your feel. It is the very same for me and my fortress. Solitude is never experienced by so many people now-a-days it is a shame, as it is definitely a very reviving and healthy experience!! Thanks so much for your example Kate, how about others?? At my work, I have a friend that´s as passionate as you are in bicycling. I joined him one day, and damn I couldn´t facce his seed and bicycling stamina! By the way I like your blogpost, you should also . You should do same on FastButter.com , expose your skill a bit more so to say. My tip for you are to contibute to http://www.fastbutter.com also. It is a user contributed social community, where you can either choose to submit your own news article or submit interesting links. There is lot of interesting articles and news to read there also. I mean speed lol 😉 misspelled it !!! It was good that you extended your description of how it feels and what it takes to do the maneuvers. It took a few of those messages before I got a feeling of how hard it is to ride this way, because your whole body then becomes a weight that you have to move to the right side to get over bumps or such. It is nice to have a place of solitude because we can depart to there when being with the people needs a break. I would say my item of this type is running, or maybe rapping when I do it alone. I guess our interests stay with us for a long time. I ran in light rain a couple of times recently and it was just great. I saw your panoramic pictures recently and they were expansive. Thanks so much Armen for your comments. Running is definitely one of those solitude moments as well and I know a lot of runnings who claim it so. I think a lot of people miss recognizing this and so never realize it is actually the solitude that is important, they think it is the running on it’s own and it is not. Freestyle rapping is certainly fairly unique so I imagine it has a lot of the same reasons to do it alone and self drive is what keeps you going. Anyway, thanks for your comments and I’m glad you saw my panoramas, one more thing I really love to do…. How amazing. It is so hard for me to unicycle. I have tried before but yea it isn’t for me. I am shocked at the ability of you and how you can stay up with regular bikers. That is awesome. When I need to get away I like to go snorkeling. I am fortunate enough to live in Florida and there are some great reefs right off the beach. I do appreciate the beautiful vast spaces around me in Canada all within an hours drives and total solitude. Calgary at 1M people is way above my likely for population, could imaging living in India with such high density of people. Incredible. Seriously incredible. Self-taught no less. Bucky Fuller was another self-taught guy. My fortress is reading. Plain Jane reading. Lots of it. Your one-of-a-kind pursuit leaves me speechless. Aside from the obvious solitude, spectacular views…..what about BEARS (yikes). A friend an I go up to Sudbury annually to collect wild blueberries. One year a massive blackbear (easily 1,000 lbs) sauntered into our clearing, sat down and enjoyed the bounty. We neither heard him nor saw him until we lifted our heads to gauge the time. Luckily we had pepper spray. Not a word of a lie….he got up, swilled that massive head of his – and walked away. I have never been so frightened, (or exhilarated).